The SMOK TFV12 V12 Replacement Coils Pack brings the world class and industry leading coil designs implemented in the TFV8 series to another level, with V12 versions of the popular X4 and Q4 coils range of 60 to 220W and 60 to 190W, respectively. ​TFV8 - The top level sub ohm atomizer adopts 4 Unique Patented Turbo Engines: V8-T8 (6.6T), V8-T6 (6.0T), V8-Q4 (5.0T), and V8 RBA (4.0T-X),which makes it a real Cloud Beast! The revolution of coils and airflow make the TFV8 a high-performance vapor beast! ​Here comes the SMOK TFV8 X-Baby Coil. The X-Baby Q2 and M2 coils are designed for TFV8 X-Baby tank. Q2 is an innovative dual coil with 0.4ohm resistance and supports 40 - 80W power; While M2 is unique dual coil with 0.25ohm resistance and can be compatible with 3.7V mechanical MOD such as Stick V8. Get them as spare parts for your X-Baby tank to enjoy deep and rich cloud taste. Please note, these atomizer heads are NOT compatible with the original TFV8. ​The new Kanger T3S TOCC replacement coils have arrived. Made with Organic cotton, these new coils have a cleaner taste and are an improvement over the old style fiber wicks. Your Authentic Kanger Protank/eVod/Unitank coils will need to be replaced every 5-10 days or so...so stock up now! As Kanger continues to expand their line of devices they also reinvent the wheel on their coils! The Kanger SSOCC coils are made out of Stainless steel and feature organic cotton wicking with a nichrome coil. The Stainless steel casing also provides longer lasting coils due to the higher heat tolerance. If you're looking for the pièce de résistance of coils then look no further, you've found them! ​Eleaf EC Heads are dual vertical coils placed parallel, which allows the 0.3Ω coils to handle up to 80W and the 0.5Ω coil up to 100W. Bigger air holes on the coil head allow the vaper to achieve maximum cloud production. The iJust 2 EC replacement heads use 100% pure cotton and are compatible with the ijust2 Tank, Melo and Melo 2 Tank. The newly updated Aspire Nautilus advanced bottom vertical coil (BVC) system is designed to last longer and provide a pure and clean taste from the e-liquid. 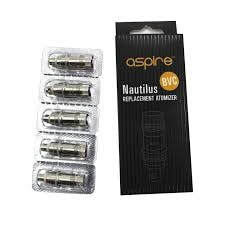 These coils are designed to fit the Aspire Mini Nautilus tank. The Atlantis Tank Replacement Coils you all have been waiting for!! These keep your beastly Atlantis tank going none stop! Joyetech’s Replacement Coils utilize a new method of “juice injection”. Their JVIC (Juice Vertical Injection Coil) System which is a unique method of wicking in which a vertical wicked coil sits directly below the tank. This allows the material to absorb only as much liquid as it needs, dry hits and flooding may be a thing of the past with this new coil design! Compatible with: Joyetech Penguin, Dolphin. 1x - 5 Pack of Joyetech Penguin Replacement Coils 0.25, 0.6, or 1.2.